If you are a regular reader here you probably already know that I have a type-a personality so it should come as no surprise that messes drive me crazy. With that said, I’ve really been working to accept that messes come with being a mom and allow my boys to make more messes (which is so much easier for me to do now that they can help clean them up lol). I’ll be honest though, it took a long time for me to embrace the messes. I didn’t just birth kids and immediately appreciate the messes they brought with. As much as I typically have avoided messes though, for some reason, when it comes to kid activities I typically tend to pick the messiest crafts and activities I can. (It’s probably due to all the years I spent as a preschool teacher!) There’s something about messy play that gets kids excited and I just love seeing their faces light up when they realize that the adult in their life is not only going to allow them to make a mess but they are encouraging them to do so. This weekend’s activity? Making glow in the dark pumpkins! I had been wanting to do this with my boys since I painted a pretty galaxy pumpkin last fall. While I designed a neat polka dotted pumpkin, my boys couldn’t resist squeezing as much paint as possible on to their pumpkins in an effort to make “slime” pumpkins. It was hard to resist showing them how to gently squeeze the paint tube in order to make a Pinterest perfect pumpkin but I took a deep breath and I let them decorate the pumpkins their way. And they used a LOT of paint. A lot. I’m pretty sure they are going to take days to dry but they had fun creating something with their mom so that is all that matters. Every year, when we pull out these pumpkins in the fall, they will remember that time their mom spent with them and I will remember their giggles as the almost empty paint tube made sounds when they squeezed it. This is what is important. If I had been worried about the mess the whole time I would have completely missed these moments of joy. Of course I still went into the activity prepared and was ready for the mess since I know my boys. We had bought a large box of Huggies® One and Done® Wipes from Sam’s Club and kept them nearby during the whole activity. I like these wipes because they come in smaller soft packs with an EZ Pull® Dispenser that makes getting wipes out of the package easy, even when I’m trying to do so one handed. The wipes themselves are thick, have a pleasant scent and feature Huggies’ Triple Clean Layers that clean up messes without a lot of scrubbing. My boys may be 8 and 9 years old but I still find many uses for wipes and always have packs around my home and in my car. Sure enough, they came in handy for this messy activity. From wiping off “mistakes” on my pumpkin to wiping drips off the ground to cleaning messy hands (and legs and wherever else the paint ended up), I was happy we had them (and so was Lucas as you can see below lol). Anyways, enough talk about the messes…let’s get to the fun I promised :) This DIY is so easy and really doesn’t require much. You’ll need glow in the dark paints (I used fabric paints) and a pumpkin to paint. I chose ceramic pumpkins but you can use fake foam pumpkins or even real pumpkins for this activity. How you paint the pumpkin will depend on your design. Lucas created chunks of colors on his pumpkin while Jacob was (I think) trying to create rings of color around his. For my polka dot pumpkin, I made dots in one section at a time, making a few dots in one color before switching to another color to make three more dots, and so on before I moved to the next section. I was going to leave the stem unpainted but decided to paint stripes on it. I just started at the base of the stem and painted around the stem with one color and then added more colors above that, making a rainbow like design. Once you are happy with your design let it dry and then expose it to sunlight for a few hours so that it will glow! Just a note- if it doesn’t glow very brightly it just needs more sunlight. Expose it to direct sunlight for a few more hours. The boys and I had so much fun painting our pumpkins (and even more fun seeing them glow in a dark room)! I love shopping at my local club because I can buy in bulk which means less trips to the store. They also have club pickup which means you can shop online and everything is ready for pickup when you arrive. This is an awesome service for busy moms who don’t want to wander the aisles with kids in tow. If you make this Halloween craft I’d love to see your glow in the dark pumpkins so please tag me on Twitter (@aliciamarie112) or share with me on Facebook! Remember- have fun and embrace the mess! I love this idea for kids to decorate pumpkins when they are too young to carve. It is funny…my youngest is 14 and I still buy wipes regularly to keep in the car and home to clean hands and messes! I can have a hard time with letting the kids make a mess also! I know I need to let them at times but I need to clean it up pretty quickly. I think we will do something like this for Halloween. I like the glow-in-the-dark. These look like they would be super-fun for kids to make. And yes, sometimes you just have to embrace the mess! Having the wipes nearby would help make it a little easier to do so. This is the coolest thing ever! I need to do this with the kids for Halloween. I think they’d make the best decorations. I know what I’m going to be making a metric ton of with the kids for Halloween! Those look absolutely amazing. I can’t wait! 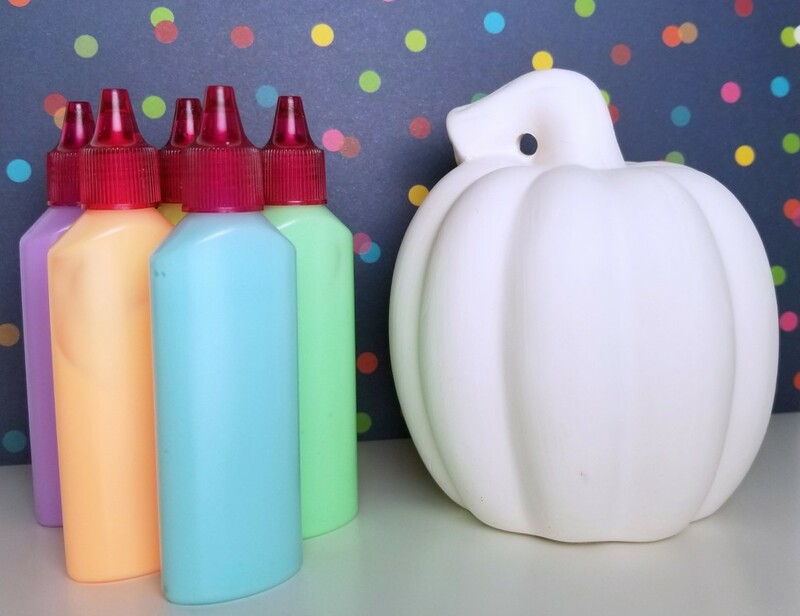 I think this glow in the dark painting idea is so cute for pumpkin parties! We have pumpkin carving parties and we let the little ones paint instead of carve. This would be a fresh idea to try. We’ll have to stock up on the wipes first too! Aww, what a cute project! These are going to be such awesome decorations! Wow, this is such a cute idea for Halloween. I need to try this DIY with my kids too! What a fun idea! I know my kids would get such a kick out of these! This is such a cute idea to decorate pumpkins. I will have to grab some supplies to make some for Halloween. Huggies One and Done Wipes are great for cleanups. I always keep some in the car for emergencies. Those look like so much fun! I would love to do this with my girls. I know they would really love it as well. Fun!! What a fun and simple way to have some afternoon fun, I totally want to try these! I am loving that neon paint! I am going to have to try this with my kiddo. This is really cool! I love this idea! Will try this for Fall decorations this year! What a cute project for the fall. The boys look like they enjoyed it. Wipes can be used for so much more than baby bums. Where did you get your ceramic pumpkins from? Thanks! :) I found them at Hobby Lobby in the seasonal section where the kids seasonal craft supplies are but any pumpkins should work for this (including real or foam ones). Awww. I wanted to see the “slime pumpkins” glowing. Did the slime pumpkins dry yet? How long did they take to dry? I know my son will be putting a lot on as well. Lol. Yes, they are all dry now :) lol. I let them sit for a few days to dry. If your child doesn’t gob it on it should only take a day or two. You could even just put the paint on a paper plate and let them use a paintbrush so they don’t use as much in one spot and then it should really just take a day. OMG I can totally relate to this. Such a hard challenge. Impressed how you embraced it. What a cool project. I did the same campaign and we made decorated pumpkins as well.